What exactly is precast specifically precast concrete steps? Precast means the product is manufactured, cast in a controlled environment, then delivered to the job site already made. Our steps are cast, made, in steel forms using our specifically designed concrete mix and steel re-enforcing allowing us to achieve extremely high strength and durable precast concrete steps. 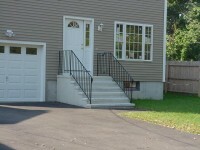 There are a number of advantages to precast concrete steps. First they are significantly less expensive than a mason built step, typically less than one half, but it can be as much as two to three time less expensive. Just because they are less expensive does not mean they are of less quality. The fact is they are every bit the quality of mason built steps. Our concrete is significantly stronger in psi than any mason built step. Being monolithic, one solid piece, they are less susceptible to cracking and deterioration due to the severe weather changes such as the freeze thaw cycle. Being monolithic with steel reinforcing should they move after installation they will not fall apart nor will they do any damage to the house and can be re set with minimal expense. Masonry steps should they settle or move cannot be reset and tend to fall apart after this happens. Pre cast steps are typically installed by one of our trained installation crew within an hour or two. Masons may take up to two to three weeks for the same size step. Where able we bolt angle iron on the foundation of the home to support the rear of the step and concrete pads to support the front. Masonry steps require elaborate and expensive footings for support. Should these footings fail it is extremely difficult if not impossible to reset or repair, very expensive. Should our precast steps settle or pull away they can be re set for a minimal charge, with no damage to the house or the step. It is important to note and remember these steps are made of concrete and as such, just like any masonry product, salts and some chemicals can severely damage your precast step. The use of a concrete sealer can help to protect the step from these salts and chemicals. Your precast step should last 20, 30 even 40 years if taken care of properly. Take a look through our photo gallery to see the finished product and see why a precast concrete step would be a great choice for your home. At Mono-Crete Step we have been manufacturing and has installed thousands of precast concrete steps since we started in 1974. Our quality and service sets us apart from the rest. Give us a call today to discuss your needs and request a free estimate. Keep in mind you can also add iron or aluminum handrails to your new step. We manufacture iron and aluminum railings. In addition to our standard railings we can also do custom iron and aluminum railings.